On Saturday, Rosalie and I spent the day with Auntie Laura. 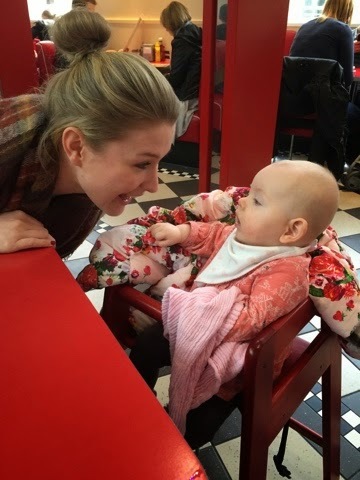 We went out for lunch and Rosalie had her first diner experience. In the evening, Rosalie and I went to my mums to spend the night. On Sunday we had a family roast dinner, just the three of us. I did roast beef and it was a success. Yey! I’m getting rather good at a roast dinner now. On Monday, I did a little spring clean and cleaned the windows. My Mum and Auntie popped over in the afternoon to see us. On Wednesday, I went to my monthly waxing session and catch up with a my friend Sophie so Rosalie stayed in with daddy. After a busy week, on Thursday and Friday Rosalie and I stayed in, caught up on chores and chilled around the house. She is also still having 6 breast feeds a day at 5am, 8.30am, 11am, 2pm, 5pm and 7pm. You can view Rosalie’s 28th Week of life video on youtube here.